40% Off while Supplies Last on Nooka Watches from Attic Online! You'll have to pay 60% of the price. Hey, it beats paying 100% right? You'll also have to order sooner than later, because this promotional offer lasts until Attic's supply of Nooka watches runs out of time. Literally. Purchase must be made through Attic's Online Shop. Free shipping is not included. This is a limited time offer. 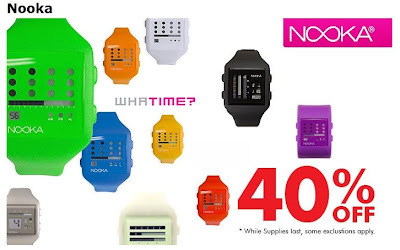 The 40% discount on Nooka watches lasts as long as Attic's supplies do. In other words, you gotta catch 'em know for the deal. We at Qmania love clocking the most watched and buzzworthy deals around. Is your brand doing something buzzworthy? Create a Qmania profile and enjoy the benefits.